When city leaders told us that the NBA would put Oklahoma City on the international stage, I’m not sure this is what they had in mind. Yesterday afternoon, news came out that Celtics star Kyrie Irving is producing a horror movie of sorts about Effie the Ghost – the apparition that allegedly haunts the Skirvin Hotel in downtown Oklahoma City. 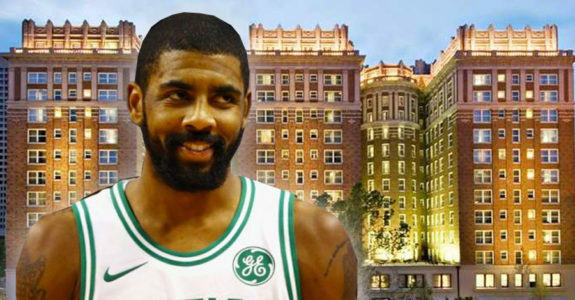 Celtics guard Kyrie Irving will star in and serve as an executive producer for a horror movie about the Skirvin Hotel in Oklahoma City, according to Variety. Yep, it’s official. We’ve reached the point in the digital content boom where oral histories that haven’t even been published yet are now being optioned into movies. I guess that means we should get to work on an alternative oral history where Sam Presti never trades James Harden. It would be a hit! Some players even refuse to lodge at Skirvin Hotel because of its rep. The alleged hauntings started occurring in the 1930s. The film is said to be a blend of “scares, satire, wit and social commentary inspired by the folklore of Skirvin Hotel,” which opened in 1911. Geeze. If Kyrie Irving thinks his Skirvin experiences are “interesting,” maybe he should stay at the Biltmore on Meridian the next time he’s in town. Its halls are haunted by meth addicts and chlamydia. Based on experience, I do not think movie makers will get any inside access to the hotel. Calls to Mayor David Holt and others in the local entertainment and event community lead me to think this is an idea hatched in Hollywood with little effort made to see if this is something that might be welcome by the hotel or the community. Locals would likely cheer such a production. Holt and others see a chance the hotel would become a popular destination nationwide with such publicity, but the Skirvin’s operators have indicated time and time again they would prefer this tale no longer be told. I get the Skirvin’s frustrations. If I owned a hotel, I doubt I’d want the general public to associate it with suicidal ghosts that take showers with guests. Then again, maybe they should lighten up and be positive – Irving could make a movie about the hotel’s bed bug problem instead. Maybe Thunder players can write about the ghosts of Donovan Mitchell and Rudy Gobert that are haunting them after being chased out of the playoffs last year. Skirvin officials might be happy with the Kyrie Irving project if, at the end, they show the ghosts were just a bunch of meddling teenagers in a ruse masterminded by the owners of the Colcord Hotel. Zoinks! I hope that this flick can measure up to OKC’s other NBA movie achievement: Thunderstruck. The bar has been set pretty darned high. I mean, I was “ghosted” once at the Skirvin but what was I expecting, she was a little out of my league and probably not near drunk enough to make those type of bad decisions. I can say, the breakfast buffet is a wonderful place to eat your emotions at the next morning.